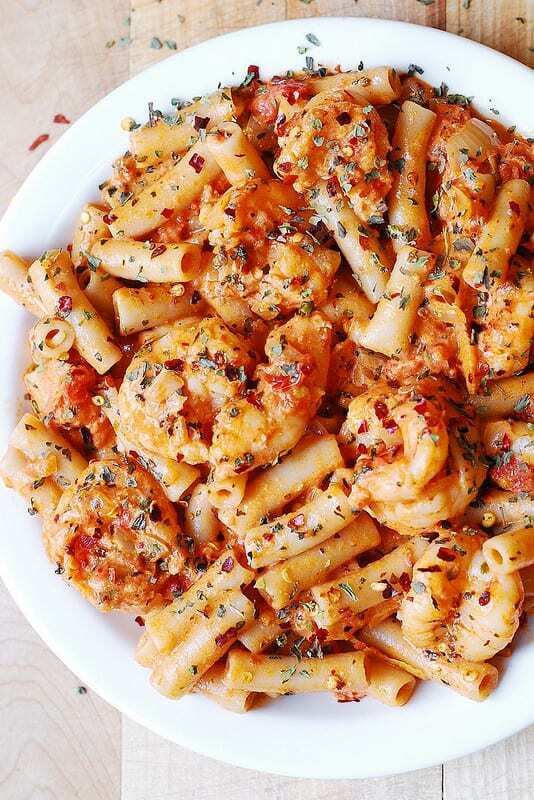 Spicy Shrimp Pasta in Garlic Tomato Cream Sauce – shrimp seared on stove top with crushed red pepper, paprika, and salt, then smothered in a spicy cream sauce made with chopped onions, minced garlic, crushed tomatoes and cream. Seasoned with basil and oregano. Delicious, creamy shrimp pasta recipe with lots of bold flavors! 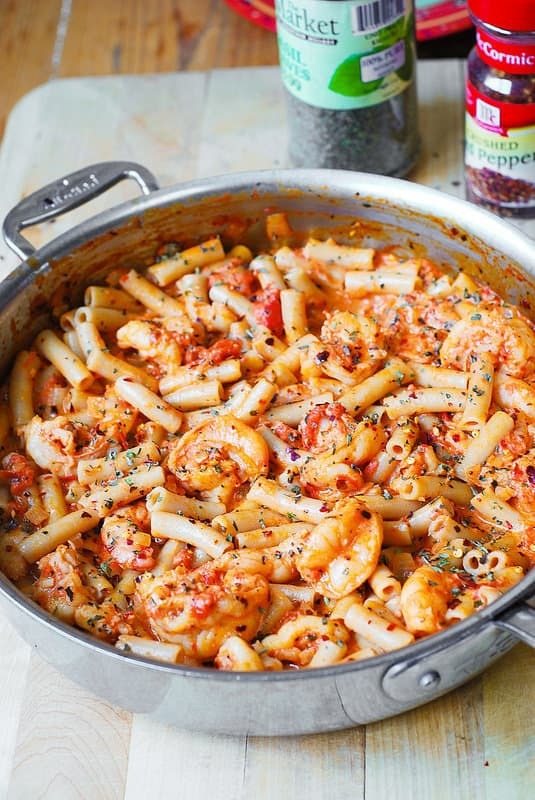 This spicy shrimp pasta has everything you crave for in an Italian pasta: easy creamy tomato sauce made from scratch, seafood, spices (garlic, paprika, basil, oregano, crushed red pepper) – all of that over the perfectly shaped penne pasta. Simple recipe that you can make at home. 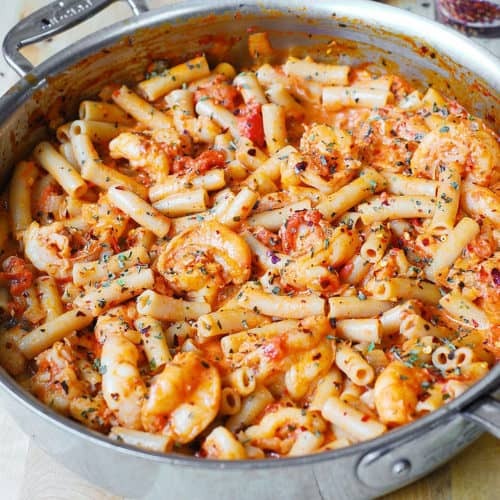 Penne is perfect for this pasta dish as it holds the sauce very well, and with every bite you will get not only pasta and shrimp but a generous scoop of spicy tomato cream sauce too! I’ve used gluten free pasta (brown rice penne) for this dish as well, and it was marvelous! Whichever pasta you use, make sure to cook it al dente, then rinse it with cold water, drain it, and only then add it to the sauce. 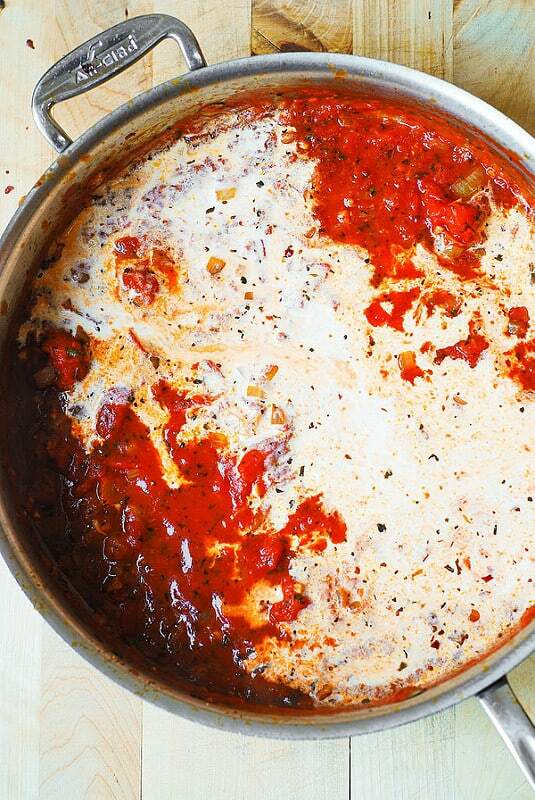 This will preserve the pasta structure and prevent it from getting mushy in a creamy sauce. Next, add crushed tomatoes and chicken bullion cube dissolved in 1/4 cup boiling water. Add basil and oregano, mix everything, bring to boil, reduce to simmer. 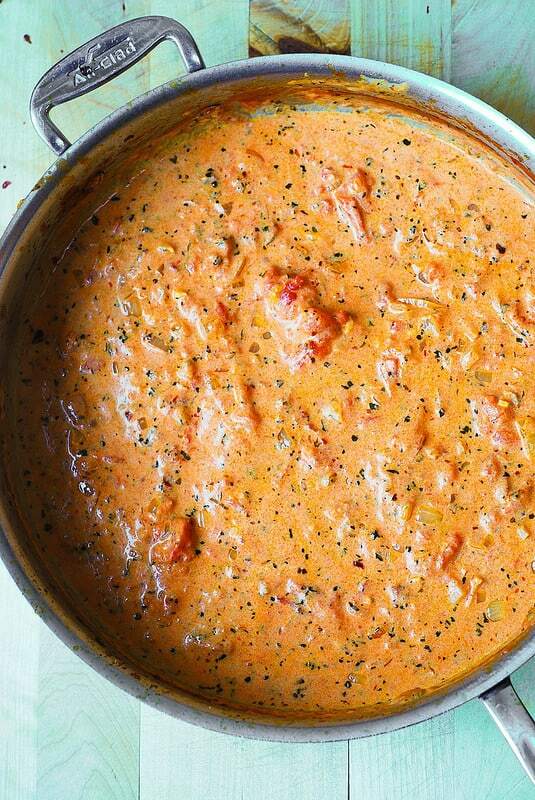 Simmer for about 10-15 minutes, mixing occasionally and crushing all tomatoes into very small bites, until the garlic tomato cream sauce reduces just a bit. Season with more red pepper and salt, if needed. Add back the shrimp and pasta. Mix everything well to combine. Add more salt and pepper if necessary. Add more spices (crushed red pepper, basil, oregano), if needed. 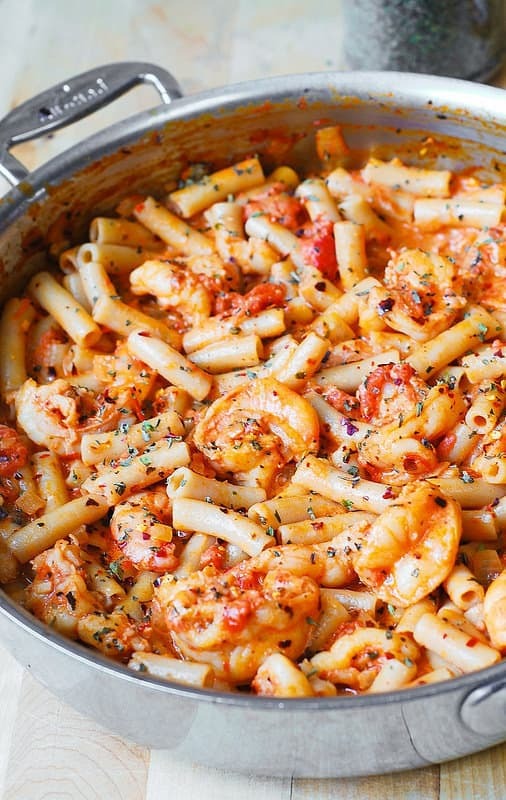 Gently reheat your spicy shrimp pasta. 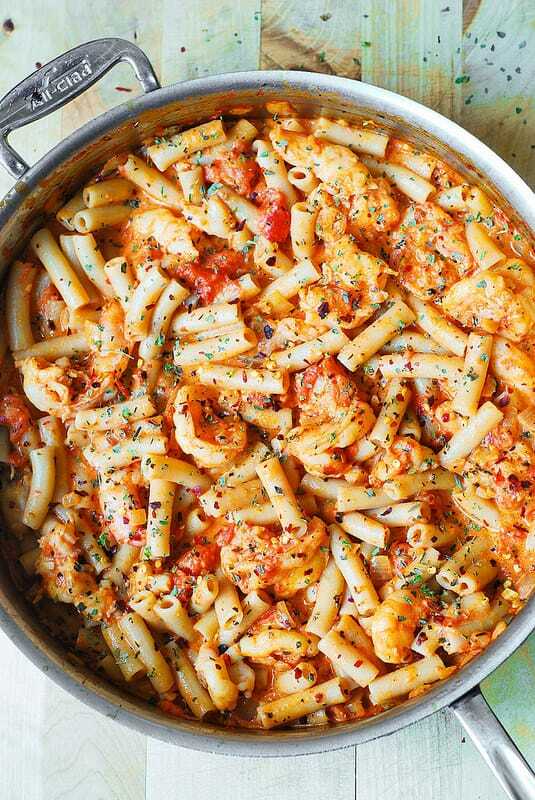 Italian-style pasta with spicy shrimp smothered in a homemade garlic tomato cream sauce. Easy shrimp pasta recipe that you can make at home any time with easy ingredients! 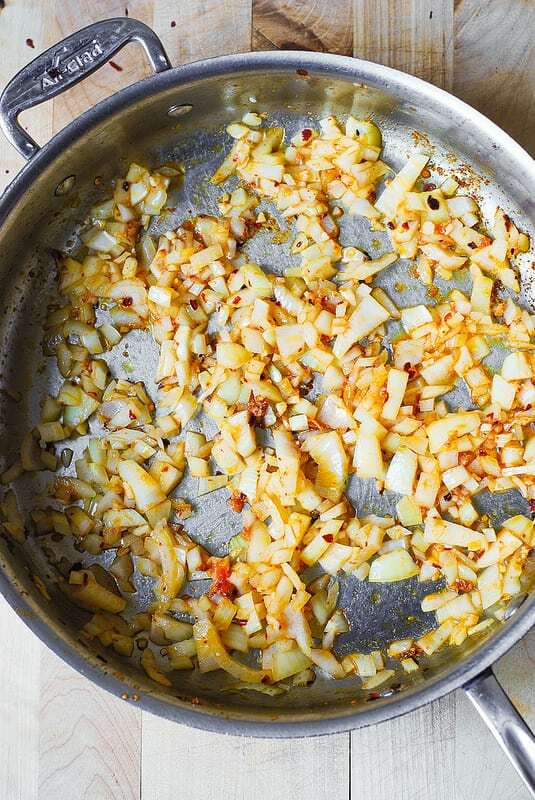 To the same skillet, add chopped onion and minced garlic and cook on medium high heat in the olive oil that will have a nice reddish color from paprika and crushed red pepper. Cook for about 2 minutes, occasionally stirring, until onions soften. Add crushed tomatoes and chicken bullion cube dissolved in 1/4 cup boiling water. Add basil and oregano, mix, bring to boil and reduce to simmer. Simmer for about 10-15 minutes, mixing occasionally and crushing all tomatoes into very small bites, until the sauce reduces just a bit. Season with more red pepper and salt, if needed. In the end, while on simmer, add heavy cream, mix it in, and immediately remove from heat. In the mean time, bring a large pot of water to boil and cook pasta al dente according to the package instructions. Drain. Add back the cooked shrimp and cooked and drained pasta to the skillet with the sauce. Mix everything well to combine. Reheat on low simmer, if needed. 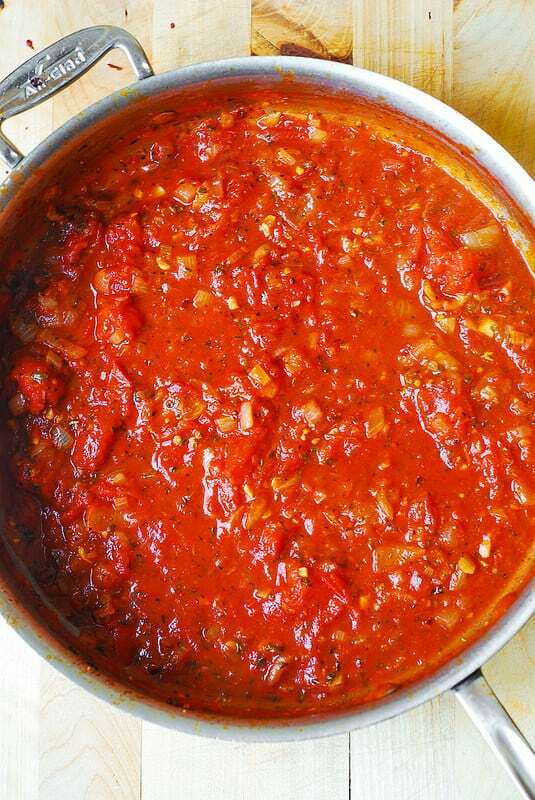 Do not bring to boil or high heat as it might affect the sauce texture. Add more salt and pepper if necessary. ive been making this for a really long time now. 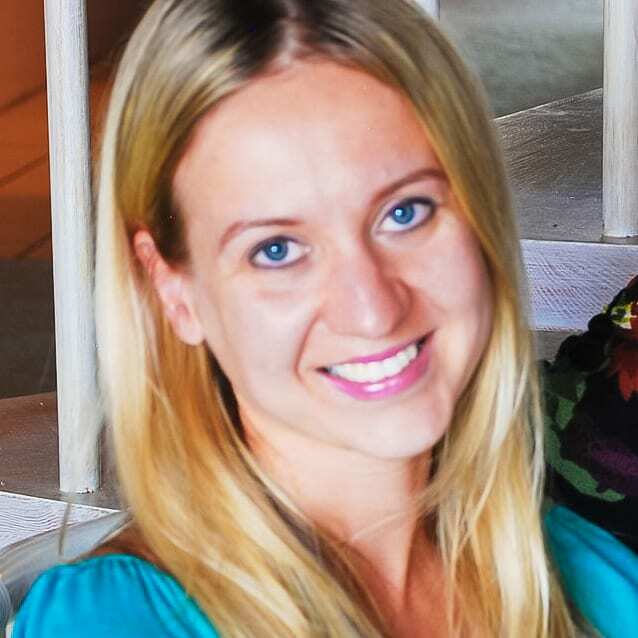 Thank you for much for the base recipe Julia. I’ve added mushrooms and 1/4 cup of (Cabernet) red wine to this dish before adding the diced tomatoes. The flavor is out of this world! Do you need chicken bouillon? Chicken bouillon cube adds lots of flavor, but you can skip it if you like. If you choose not to use it, make sure to season the dish with enough salt and dried basil. 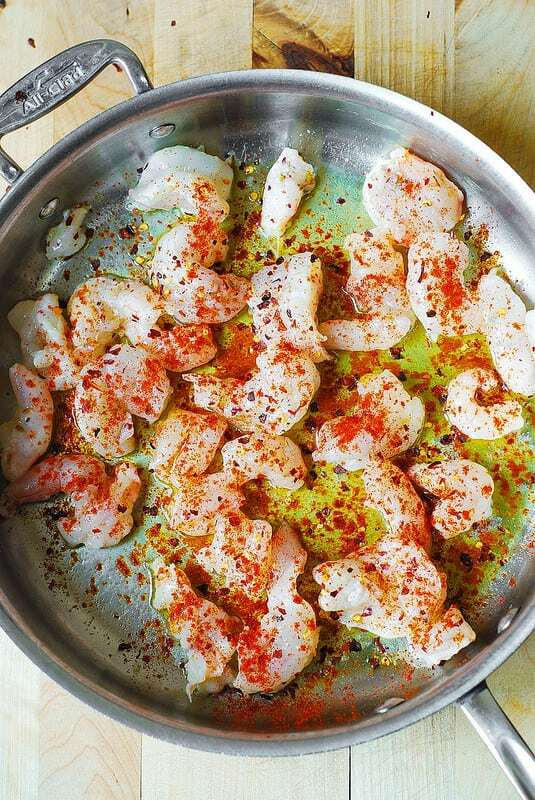 Best shrimp recipe. Love the fact that it’s easy. That is how I cook. Give me the ingredients directions …. That is probably why I don’t bake! Super flavorful. It can suit any spice/rich flavors depending on how much is added. 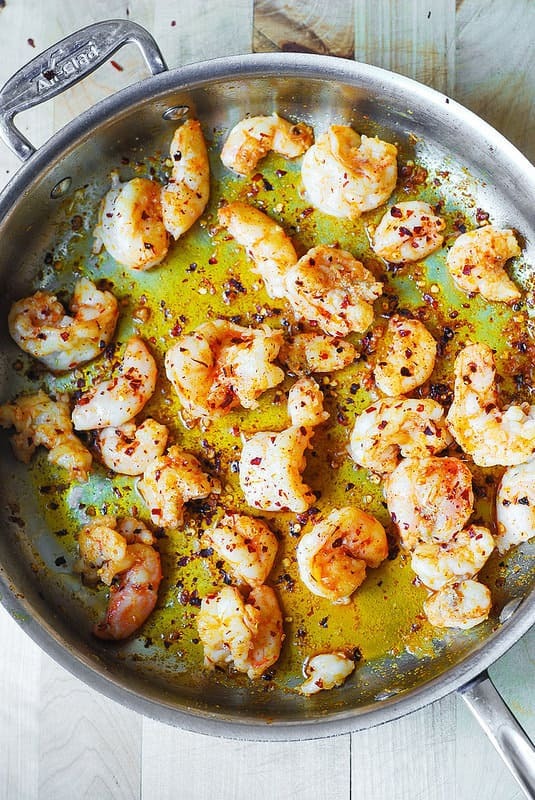 Best shrimp recipe I have ever had! Thank you for such a wonderful comment! So glad you enjoyed the recipe! Could this be served over rice? Yes, you can serve this over rice and omit pasta. It will be delicious! Do you think this would be good if I added mushrooms? Mushrooms would be delicious with shrimp pasta!